On April 4th 2013, the Congress Vice President Mr Rahul Gandhi addressed a gathering of CII (Confederation of Indian Industry). He described his understanding of the problems facing the country and his vision for how these problems ought to be addressed. I appreciate both his and Mr Modi’s informal styles of speaking and I think this kind of articulation on both sides is a healthy development. Lets take a look at the “Idea of Rahul”. 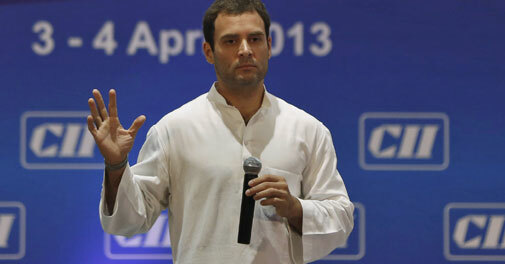 First off, the Idea of Rahul is a misnomer. The operative principles behind it are those that are actually in practice for 65 years now. What we see around us today are the effects of these practices. Mr Gandhi in his speech reaffirmed these practices and the only new thing one heard was a renewed call for doing more of the same thing. This time deeper, more efficiently at a higher cost. To supporters of the establishment it has always seemed unfair that Mr Modi gets to play the game on a clean slate while Mr Gandhi is burdened with having to explain why it is that a renewed commitment to the same ideas that left us in third world status can produce different outcomes. However Mr Gandhi managed to shirk off these burdens and has managed to achieve the status of a rank outsider to his own government. Lets set that aside and focus on the “vision” part. This approach is the crux of the vision of Mr Gandhi. What are simply rules for non-discriminatory access to public goods are now wrapped in a guarantee of legally enforceable rights. A quick overview of these rights paradigms are in order for those who are a bit unfamiliar. Negative rights : Calls for people to forbear from certain activity like punching your in your face or stealing your stuff. These are very well understood and date back to primitive society where hominids turned in their natural instincts for violence to the custody of the state. Positive rights : Calls for people to demand that others provide them some goods as a matter of right. So you have to DO something rather than FORBEAR from doing something in the negative rights scenario. The claims made under this are as wide ranging as ramps for the handicapped to extreme cases of paying off a faction in exchange for their votes. Samaritan rights : This is a special category of positive rights, where someone can walk up to you and only you and demand a payment as matter of right. I added this in after observing how the Congress’ flagship “Right to Education” works on the ground. It is not sufficient that the group claiming lack of privilege is saved – but it demands to be saved by a particular entity. For example this right is asserted against the most prominent school in the area rather than the second most prominent school or the government school. Mr Gandhi envisions an India empowered with a long list of positive rights. A list with various benefits and exemptions piled one on top of another. Mr Modi envisions an India with negative rights which are far easier to administer and are likely to see dramatically less litigation because the boundaries are well understood. This is the fundamental difference between the two sides. Once you buy into Mr Gandhi’s view of a society driven by positive rights, you have to ask the next obvious question, “How would this work?”. Positive rights presupposes an environment of scarcity, because without scarcity these rights are as meaningful as a “Right to watch T20 cricket on TV”. So when you see laws like the Right to Education or Information you should sit up and ask how this right, which translate into statutory burdens on the other side, will remove the fundamental problem of scarcity. In a scarcity environment if a large number of people are going to assert their positive rights, this leads to the greatest problem of all. How to justly adjudicate competing claims ? This requires a network of institutions each capable of “deep monitoring”. These institutions would in theory be used to weed out the bogus claims from the genuine ones. This is where systems like Aadhaar and various other bodies are placed. The theory is you could give this whole scheme a coat of respectability if the state could monitor consumption patterns remotely and in sufficiently fine grain. Of course, even the above wont work as the primary political institution in India is not “need based transfers” but social justice. So after an initial round these transfer payments will and must be aligned with the social justice platforms because that is how the state and in turn political power is organized. We already see that in the Right to Education, Food,Prime Ministers 15 Point Program, the AP Congress caste based waiver of electricity dues, the setting up of public universities giving preference to minorities, and on and on. Even if the whole scheme is built by the amazing brain power of Nilekani to a 100% efficiency, it will lead us back to the same familiar situation we are in today. Factions will form around access to these positive rights in such a way that the faction with a higher level of political participation will have their claims heard ahead of those with lower levels of participation. The factions that capture this kind of power – for example by capturing the institutions that monitor the schemes – will simply seek to throw a shroud of secrecy over the program itself. This way new entrants, claimaints to these same positive rights will have to cross hurdles the incumbents never had to. Just look at the violent Gujjar and Jat protests sweeping parts of the country. You will notice how they are being subject to close scrutiny to access the same benefits that factions from Tamilnadu have simply taken for granted for 65 years. Also observe how castes and communities with low levels of political participation, like those breaking stones get almost nothing while the institutions that are supposed to monitor access look the other way. A reinvigorated emphasis on positive rights will only make groups stick tighter. The prize for capturing access to these goods will not be enhanced many fold. Groups will duke it out one against the other and almost always ravage the unprotected participants. The Courts in this scheme are just bystanders and will seek to drive a compromise and leave the tough questions for later. Time’s running out there too as everytime a compromise is made the political class builds an embankment by chipping away at the constitution. We’ve been there done that and we’ve failed. Embracing the excluded is essential to the wealth of the nation. If we do not embrace them we will all suffer. Its very simple In a democracy, the poor have a veto. And we have to carry the poor and the weak with us. India will only move forward with inclusive growth that embraces everyone and is open and attainable to those inside this room and those very very far outside. Now there is a strong connection between harmony and growth. I spoke about this energy and this movement. and there is two ways this movement can go, it can go harmoniously or it can go disrupted and the idea of the Congress party is that it should go harmoniously. The basic assumption is economic activity is by itself exclusive, in the sense that those who participate in it corner a disproprotionate share of the benefits. It is questionable if the tension between growth and harmony exists in the manner Mr Gandhi presents it to us. Can there be more harmony with groups fighting over scraps, such as those unfortunate souls on Tilak Express, or does harmony follow when there is growth in an environment of simple non discrimnatory access ? Going with the American theme in his speech. One wonders if Mr Gandhi considered the possibility that these folks were not coming to Mumbai in search of their dreams, in the same sense a beauty queen from the Midwest goes to Hollywood. They were looking to survive, escape the horrific Darkness brought upon by these same policies. It is important to note that the CII is not representative of entreprenuerial spirit in the country. Like political parties most of these houses are family run and have immediate access to policy makers and regulators the small time startups do not possess. The general theme of inclusiveness in the business environment is that these corporates must pitch in for the loosely defined goal of inclusiveness. The CII folks are eager because their proximity to power, admirably mentioned by Mr Gandhi as the ability to call up Montek, ensures that they can comply with whatever regulation that is about to come their way. Startups cannot, they can barely keep up with the barrage of circulars and clarfications from the taxman. Public private partnerships are in general a bad idea in my opinion. The whole principle is that the state would trade in some part of the public trust to private individuals who are allowed to exploit it. Even though Mr Gandhi never mentioned the Coal Scam, we all know the issues involved there. Those with access can corner these goods in the name of providing public benefits, while the state can make an excuse for not auctioning these citing the same reasons. To conclude, a system of positive rights will cause groups to be at each others throats. It is bad for industry as they have to comply with various regulations that have nothing to do with their core businesses. Industries also have to secure approvals for their enterprise from a number of politically active stakeholders because anyone can walk up and claim something or the other. The whole idea of conditional growth only in the presence of an acceptable transfer payment will make way for an arbitrary state. The Rule of Law takes a back seat as the ever expanding apparatus of government gets entangled in endless tribunals of balancing one set of claims against another. The energy spent in securing a spot on the negotiating table of positive rights will cause a beehive like activity where no honey is produced.